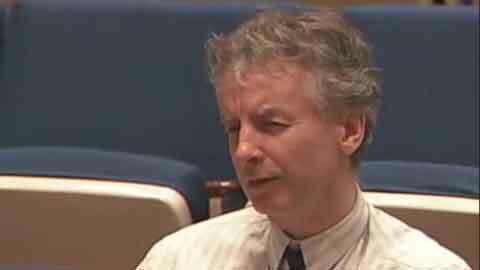 UNITED NATIONS, March 12 -- Agence France Presse scribe Tim Witcher, who has now filed a frivolous UN Security complaint against Inner City Press for calling him a lapdog -- not even a curse word -- has in the past told Inner City Press “you just write any old bullsh*t.” Audio here, at Minute 0:35. If Witcher thought it was fine to swear at Inner City Press, what is the basis of his UN Security complaint, no copy of which has yet been provided despite Inner City Press' request? So what does the UN do with a not only frivolous, but clearly pre-textual complaint? As shown, Witcher despite having STARTED a UN Correspondents Association proceeding to censure Inner City Press, insisted that he had not been the drafter, because if it had been up to him, “you would have been kicked out.” Audio of that, here. Witcher wanted Inner City Press kicked out, and now attempts to conflate a verbal disagreement which he began by hissing “lies and distortion” which drew the reply “lapdog” into a UN Security incident. But it is an incident that has nothing to do with security. It is an attempt at censorship, for reporting that as the audio reflects, Witcher does not like. Is writing critically about Agence France Presse and its UN bureau's demonstrable closeness with the French Mission and with Herve Ladsous, the fourth Frenchman in a row to head UN Peacekeeping, a UN Security incident? What are the rules? Should UN Security accept and process, and keep confidential, frivolous complaints of one media against another, about entirely free speech and freedom of the press issues? Where is Ban Ki-moon's Department of Public Information in all this? The same DPI which invited Inner City Press to a session on February 22 at which UNCA President Pamela Falk was allowed to scream at Inner City Press “mugger” and “you call yourself a journalist”? DPI said nothing about that. But now UNCA “leader” Witcher has filed a UN Security complaint about being called a lapdog, after he threw the first verbal insult, hissing “lies and distortion”? After, as shown on this tape, he told Inner City Press “you just write any old bullsh*t”? That's just what this is. Watch this site.